Local startups in Lismore had the opportunity to pitch their business ideas today to some of the best business minds in Australia, including ex-Telstra CEO David Thodey, when the Jobs for NSW Board visited Southern Cross University. 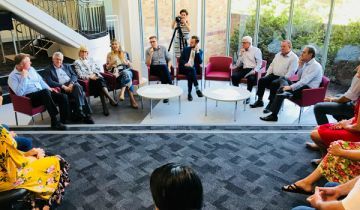 The startups were among the first seven companies to participate in a new intensive six month program at Southern Cross University’s (SCU) Enterprise lab, which supports business ideas and helps startups to grow. Jobs for NSW was established by the NSW Government to support the startup sector and high potential SMEs and to help create jobs. It has a $190 million fund, 30 per cent of which has been designated for regional areas of the state. Member for Lismore Thomas George said the Jobs for NSW Board visit to Lismore was an incredible opportunity for some of the most promising startup businesses in the region to pitch their ideas. 'We have a fantastic environment for startup businesses and plenty of talent to showcase,' Mr George said. 'This group of seven great startups are the first to participate in the SCU’s 'Startups in Residence' Program. 'The program is supported by SCU’s participation in the Government’s $18 million Boosting Business Innovation initiative and offers startups free co-working space and resources at the Enterprise Lab to help them grow and scale their ideas." Desert Pea Media – a platform which showcases film and music to create conversations on social change. Deputy Premier John Barilaro said the NSW Government is dedicated to helping the state’s startups get access to expertise to support their ideas. 'Lismore is a vibrant region with promising entrepreneurs and business owners who are keen to break through in their respective fields – that is why a visit from David Thodey and the implementation of the 'Startups in Residence' program is such a wonderful opportunity for those local startups,' Mr Barilaro said. David Thodey said Jobs for NSW is all about helping innovative and high potential companies grow and create jobs. 'The Board’s visit today is a fantastic opportunity to help us better understand the creative and business strengths of this region so we can find more opportunities to invest in high-potential, fast-growing, job-creating companies,' he said.